New to laser hair removal? Here’s everything you need to know! If you are new to laser hair removal, take the time to read the information below before your first appointment. Yes, we know technical mumbo jumbo can be boring, but it is important to familiarize yourself with this information before having laser hair removal treatments. Here at Pure Vanity Spa, we believe that client education is an important part of your ultimate satisfaction. If want to eliminate unwanted and unsightly hair in a comfortable way, Pure Vanity is your answer! We are one of the only centers in Arizona with the most current Soprano ICE Diode Lasers and fully trained and certified staff. If you’re reading this, then obviously you are interested in learning more about laser hair removal and maybe more specifically “virtually painless” laser hair removal. People have been trying to get rid of unwanted hair for decades. Different creams and devices and treatments have been developed over the years to help accomplish this goal. You may have tried depilatory creams to remove unwanted hair, electrolysis or even laser treatments in the past. The Soprano ICE is the latest advancement in laser technology and it allows a person to rid themselves of the unwanted, unsightly hair in such a way that it is virtually painless, safe, effective and long lasting. Now, when it comes to killing hair and stopping hair growth you need heat, and lots of it. In fact the heat has to penetrate all layers of the epidermis and get into the dermal layer of the skin. Why? Because the hair follicle resides in the dermal layer of your skin. And it’s the follicle that actually produces the hair. Each follicle can produce a few hairs or hundreds of hairs depending on their location on your body. How do we get enough heat to the follicle in order to destroy it, thereby preventing more hair production? Well the laser machines originally made to accomplish this task would pulse a high amount of energy in a single pulse. You would move the laser hand piece between each pulse until the entire area to be treated had been covered. The problem with these high energy pulses was that they hurt … and they hurt a lot depending on the area being treated. The Soprano ICE has solved this problem by pulsing lower amounts of energy 10 times per second while the hand piece stays in motion. This enables us to introduce the appropriate amount of heat into the given area, which will kill the actively growing follicles, but in a way that is perceived as virtually painless to the client. No more of that intense rubber band snapping sensation on the skin. We can now help you get rid of your unwanted hair simply, safely and effectively without all the oohs and ouches! Once a follicle is dead, it is dead; that means no more hair growth. Why do you need more than one treatment? Hair follicles have growth cycles, and the follicle must be in the anagen phase of its growth cycle in order to kill it. Not all follicles will be in the same phase of the growth cycle at the same time, therefore the need for multiple treatments. On average, a person will require six treatments to eliminate 80 to 90% of the unwanted hair. By the time we’ve seen someone six times, we would have caught nearly all the follicles in the anagen stage, thereby killing them for good. Any persistent or subsequent hair growth will be hair that is much finer in texture and much less dense in growth and can be addressed with “touch-up” treatments. Hormonal changes can prompt changes in hair growth. So ladies, if you change birth control pills or if you start taking hormonal replacement medications, or if you’re starting menopause you may notice more hair growth and/or hair growth in areas that you haven’t seen it before. Just be aware of that. Are there medications that affect laser hair removal? If you’re thinking of starting laser hair removal treatments, here are some things to keep in mind. If you’ve been on the medication Accutane, you must be off of the drug for at least 12 months before starting treatment. Accutane makes your skin extremely photosensitive and undergoing laser treatments will put you at a much higher risk for blisters and/or burns and as you might have guessed, we don’t want to burn anyone! If you’ve been off of Accutane for 12 months or longer, it is safe for you to have laser treatments. Certain antibiotics also make your skin much more light sensitive, so if you are on antibiotics or start taking antibiotics while getting your treatments we will need to delay further treatment until the drugs are out of your system. Typically 7-10 days after you’ve taken your last dose, it is safe to resume your laser treatments. The risks of receiving treatment while on antibiotics are increased chance for burns or blisters. If you are pregnant or thinking of becoming pregnant you are not a candidate for laser hair removal. You will be riding a hormonal roller coaster, some women have problems with thinning hair while pregnant, some have much more aggressive hair growth while pregnant. The bottom line is enjoy being pregnant, have your baby, let your hormones get back to normal and then give us a call. What about skin types and hair color? The best candidates for hair removal are those people with dark hair and light skin. 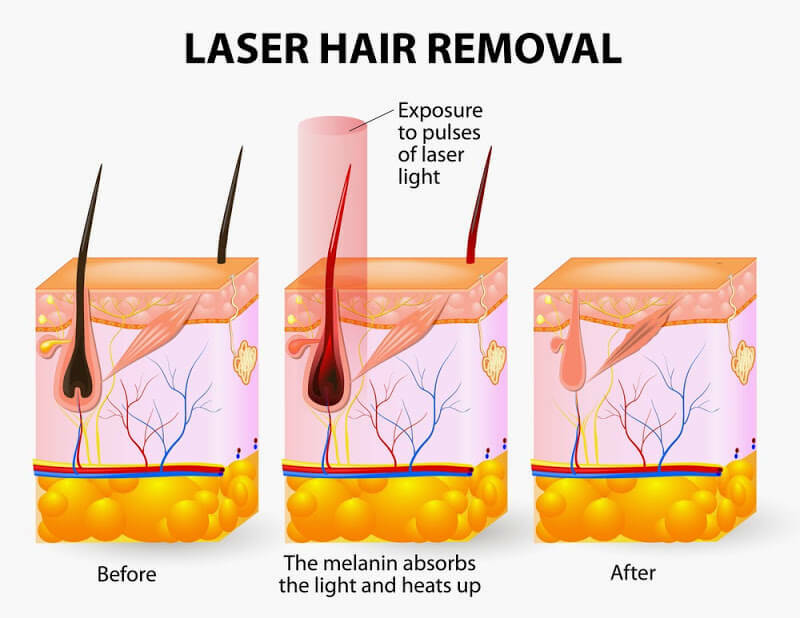 The light energy from the laser is absorbed by the pigment in the hair and the hair shaft acts as a conducting rod which transmits the heat down to the follicle. Get enough heat down there and that follicle is kaput! The darker hair absorbs the heat better than lighter hair. Fairer skin doesn’t attract the light, so essentially all of the laser energy goes to the dark pigment in the hair. This is the best case scenario. Lighter hair will still respond well, but it does have less pigment and so the heat transmission is less effective. If you have lighter hair, you will likely need more than 6 sessions. Darker skin tends to absorb some of the laser energy, so it steals away heat from the hair itself. This also makes the transmission of heat less efficient, but you still achieve your goal of stopping the unwanted hair growth. Again, you will most likely need more than 6 sessions. Gray hair … here’s the bad news. No laser has shown to be effective for treating gray hair! Why?, because there is no pigment in the gray hair, so it’s as though there is no hair at all as far as the laser is concerned. Now we have had some clients that have sworn that we helped rid them of their gray hair, but it is something that happens so unpredictably that we would not take you as a client if your hair was gray. There is a very good chance that you would see no change in your unwanted hair growth. Why waste your time and money! Typically treatments are spaced about 4-8 weeks apart depending on several factors, like the area being treated as well as how rapidly the hair growth resumes. What about shaving and waxing during laser treatments? You can shave the hair all you want in between treatments, but you can NOT wax, pluck or tweeze. We need the hair in order to transmit the heat to the follicle. When you wax, pluck or tweeze you are pulling the hair right out of the follicle and we’ve lost our means to transfer the heat to the follicle. Without the heat, we cannot kill the follicle. Well, if you’ve made it this far you must be seriously interested in getting rid of your unwanted hair. If you’re reading this, then you’ve already called to set up your appointment and we’ll see you soon. If you need to make any changes to your appointment, please call us at 480-419-8267 and someone will be happy to help you make any necessary changes. Oh, one last thing. Please be sure to shave the area that you want treated one day prior to your appointment. There will be just enough growth for us to see where the hair is coming up through the skin. If you’re doing your bikini area and don’t want to remove all of your hair, then shave off everything that you want to get rid of and leave the hair you want to keep. That way our laser techs will know exactly what you want. And finally, if you have any questions that are still unanswered, then please ask your laser technician when you come in for your first treatment. Ready to eliminate unwanted hair? See our competitive laser hair removal prices and call us today at 480-419-8267!